One of the biggest challenges someone trying to embrace a healthy lifestyle can face is vacation. Now, Supportive Partner Woman (bearer of plentiful camera equipment!) and I aren’t going anywhere until the end of September, but I’ve started thinking ahead. Primarily what kills me is the meals. I tend to embrace the “calories don’t count on vacation” philosophy. That’s obviously not true, but I did tend to go overboard on what I was eating when we’d go away. We’d sit down at a nice restaurant and while I might order a “healthy” option, it would be bathed in a cream sauce or some other preparation that would pretty much kill me. Many of you know that SPW (owner of the original geek vest!) and I go to Disney World on a regular basis. This is good and bad, as there’s a lot of lousy options to choose from. If you’re willing to do a little research, you can make some decisions ahead of time and lessen the caloric collateral damage. My first stop when I need to check Disney facts is All Ears. For more that 15 years, All Ears has been the authority for Disney info. It’s a fine site run by one of the best people I am privileged to call a friend, All Ears offers every fact you could conceivably want to know about Disney World. Curious as to what a typical room might look like in a given resort? Check All Ears. Reviews of restaurants, resorts and attractions? All Ears. Curious as to what a menu looks like at a particular restaurant? You guessed it… All Ears. Deb and her team have most of the facts and if it’s something they don’t know, they find out. Healthier items in blue, not quite-so-healthy items in red. It’s the menu section I visit most frequently. Used to be so I could drool over the latest offerings, but nowadays, it’s to see where the sensible choice might be. In addition, the menus give pricing (current as of when the menu was dated), ingredients, and other useful information. Disney has made a lot of strides over the years of serving diners with food allergies and restricted diets. As a diabetic, when I make a dining reservation, I let Disney know of my condition. When I arrive at the restaurant, a chef will come to the table and go over what is low in sugar and carbs with me. Often times, the chefs will go the extra mile and create something special. For example, when dining at ‘Ohana at Disney’s Polynesian Resort, the family style meal includes a bread pudding with bananas and caramel sauce. 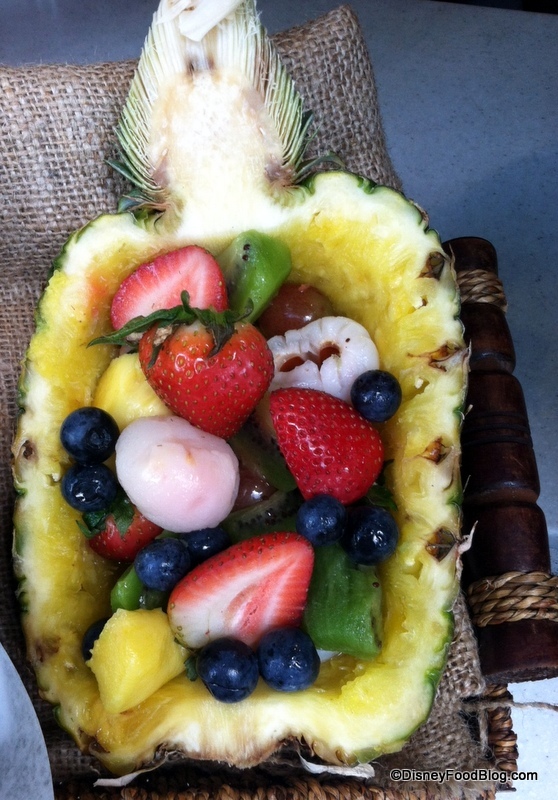 When I asked if there were alternatives, the chef came out, said he could work with this and brought me a lovely bowl of fresh fruit served in a hollowed out pineapple. Not only was it a great presentation, the fruit was very fresh and quite tasty. To summarize, it’s possible to eat healthy when you’re away on vacation. It might take a little more effort and research, but it can be done. Other places you can go for information and reviews of Disney restaurants include the Unofficial Guide to Walt Disney World, by Len Testa and Bob Sehlinger, available on Amazon in both book and Kindle format, Passporter’s Guide to Walt Disney World, available at Amazon, and Passporter’s Open Mouse for Walt Disney World and the Disney Cruise Line. This has not been updated in a few years, but has a lot of specific information useful to travelers with challenges. If you are looking for other web-based resources, Disney Food Blog has a great section regarding special diets, ranging from kosher to vegan to gluten-free to diabetic to low-carb/South Beach. Not much of a reader? In addition to having her own podcast, AJ from Disney Food Blog makes semi-regular appearances on the WDW Today podcast. Listen for her reviews and tips on dining throughout the World. I’ve concentrated on Disney because that’s where we’ve been vacationing the most, but the same principles apply anywhere you travel. Even cruise lines have gotten into the act. Royal Caribbean has a low-cal section to their dinner menus each night and offers a sugar-free or no sugar added desserts. You can continue to make better choices as to what you put in your mouth while you’re on vacation and not lose out in the taste department. I knew I was forgetting something! Thanks, SPW!